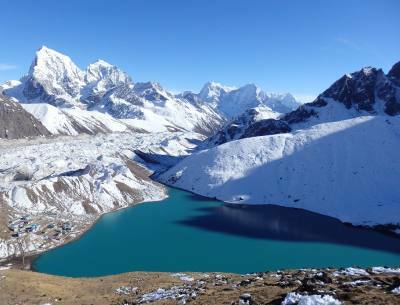 As the name itself suggests, the Everest Panorama View Trek is a perfect trip for trekkers who do not necessarily want to undergo a long journey but still want to experience the peaks of the Sagarmatha. The short trip is also a good way to get closely acquainted with the legendary Sherpa culture of the Khumbu. Accompanied by mountain peaks of Everest at each turn of the trail, the journey is a beautiful blend of the region's best hallmarks. With the trekking trail beginning from the gorgeous mountain town of Lukla, trekkers make their way through many prominent Sherpa villages and the settlements of Khumbu's many river valleys. The Everest Panorama View Trek has the trail that goes through the Sagarmatha National Park and includes destinations and sites like the famous Tengboche Monastery. Winding along the ever-flowing Dudh Koshi River, the journey is ornamented with the emerald alpine woodlands of the terrain, laden with bright rhododendrons set against the peaks. The views of Himalayas like Mount Everest (8848m), Lhotse (8414m), Nuptse (7861m), Lobuche (6119m), Taboche (6367m), the Ama Dablam (6856m), Thamserku (6608m) and the Kongde Ri (6187m) among many others all loom in the most pulchritudinous of manner in the journey. The trek is a magnificent blend of ancient culture, mind-blowing bio-diversity and scintillating views of the silver peaks towering in such a fashion as if they seem to be aiming for the zenith. 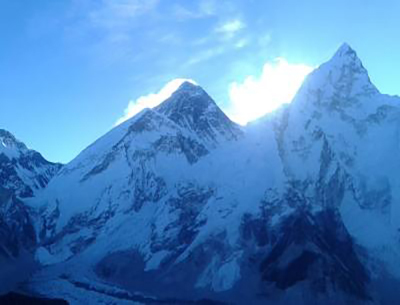 Moreover, the Everest Panorama Trek is quite suitable to do all the year round. It is an easy trekking journey that does not require any previous trekking experience at all. However, despite the journey being suitable to do throughout the year, the spring season (March to May) and the autumn season (September to December) are considered the best time to do the journey. The Everest Panorama View Trek package by Destination Unlimited is a well-rounded and best crafted short trip in the Khumbu, especially aimed at trekkers who have a short amount of time to spend in Nepal. With us, you get the best services throughout the trip and our professional guides and staff members always have the best interest of our customers as a priority at all times. You may arrive at the Tribhuvan International Airport of Nepal at any time. Upon your arrival, one of our airport representatives will greet you. He will help you get transferred to your Hotel. Overnight stay at the Hotel. For today, you will be presented with a guided sightseeing tour of the Kathmandu valley. The sites around the valley that you will be touring are the Pashupatinath Temple, the Boudhanath Temple, the Swayambhunath Stupa and the Kathmandu Durbar Square. Each of these sites is UNESCO World Heritages and hold a significant place in the religious and historical context of Nepal. They are built in the unique Nepali architectural style and you can get an amazing insight into the religious themes of the country and its historical aspects. After the tour, you will be transferred back to the Hotel. Overnight stay at the Hotel. In the morning after breakfast, you will be transferred to the airport from where you will catch your Lukla flight. The short flight to Lukla is a beautiful airplane journey from where you can get views of the amazing Himalayan peaks along the way. Upon landing at Lukla, you will trek through the beautiful terrain of the Khumbu and make your way towards the village of Phakding. Overnight stay at the guesthouse at Phakding. From Phakding, you will be trekking on the trail that winds its way into the Dudh Koshi River Valley. You will be making your way down to reach Monjo. 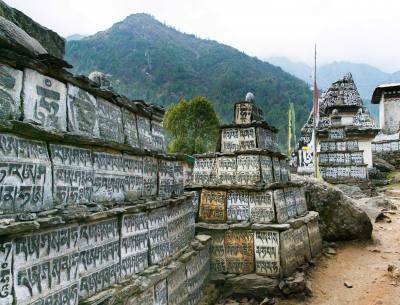 From here, you will enter the Sagarmatha National Park; making your way through the park's amazingly verdant alpine forests of tall pine and scented cedar, you will trek towards the celebrated Himalayan town of Namche Bazaar. Overnight stay at the guesthouse at Namche Bazaar. This day is sanctioned as acclimatization day. Today, you can visit the popular Everest View Hotel and look at the view of the Everest (8848m) and its neighboring Himalayas. You can also visit the Syangboche airstrip that is located on a ridge above the town of Namche from where you can get views of peaks like Lobuche (6119m), Taboche (6367m), the Ama Dablam (6856m) and many more. Overnight stay at the guesthouse at Namche. Further trekking along the valley of the Dudh Koshi from Namche, you will be passing by Phungki Thanka, and making your way from Pheriche to the village of Tengboche. You will be crossing a suspension bridge over the Imja River, and making your way through the trans-Himalayan woodlands into the village of Tengboche. The ridges that surround the village of Tengboche are filled with rhododendron trees and the views of the mountain peaks like the Ama Dablam (6856m), Thamserku (6608m), Lhotse (8414m), Nuptse (7861m), Changtse (7543m), Everest (8848m) and many more from the village are absolutely spectacular. Here, you can also visit the famous Tengboche Monastery, a spiritual center of the region and the largest Buddhist shrine of Khumbu. Overnight stay at the guesthouse at Tengboche. From Tengboche, you will retrace your steps back through the river valley, trekking on the verdant hillside track that sometimes you will share with yak caravans and donkey carts. You can also see Sherpa porters carrying heavy loads up and down the trail as well. Terrace farms and open pastures on the hillside of the valley are also great for contrasting views of the Himalayan peaks. Overnight stay at the guesthouse at Namche Bazaar. From Namche Bazaar, you will make your way back to Lukla, trekking on the trail that winds through the terrace farms and open pastures of the alpine terrain. The peaks also keep you company as you retrace your steps back through the Sagarmatha National Park. You might even catch the glimpse of the elusive Red Panda hanging on the high branches of the cedar trees. Overnight say at the guesthouse at Lukla. Catching the earliest flight back to Kathmandu, you will bid the Khumbu Mountains goodbye for the last time. Upon landing at the city, you can spend the rest of the remaining time souvenir shopping or trying out different cuisines at the many diners across the city. In the evening, you will attend a farewell dinner celebrating the completion of the trip with the team. Overnight say at the Hotel. At approximately three hours before your scheduled flight, you will be dropped off at the airport by one of our team members, from where you will depart.